BURLINGTON, Mass. 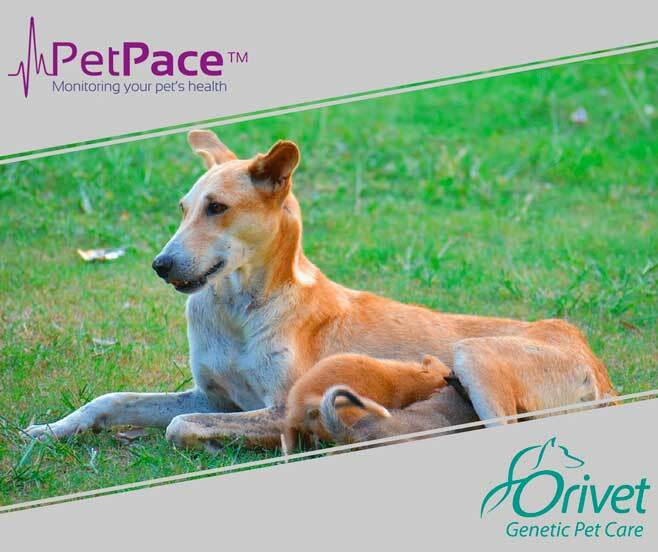 — PetPace, the makers of a smart health-monitoring collar for pets, and Orivet, a leader in pet genetic testing, today announced the launch of a groundbreaking study to identify and eventually predict problems and complications affecting pregnant dogs. This study is an extension of another ongoing general study of pregnant dogs sponsored by PetPace and conducted by Dr. Smadar Tal, DVM, DACT, DECAR, a veterinarian specializing in reproduction. The two companies are global leaders in their respective fields, delivering innovative technology that helps breeders, veterinarians and pet owners provide unprecedented levels of medical care for dogs and cats. The combination of genetic testing for personalized health risk analysis with remote, continuous monitoring of vital signs and behavior and real-time alerting and analytics, enables caretakers to provide outstanding medical care to pets. Dystocia, the medical term for difficulty giving birth, affects upwards of 10% of pregnant dogs. Uterine Inertia is by far the most common cause of dystocia in dogs, accounting for over 70% of cases. Uterine Inertia involves absent or weak uterine contractions, and thus an inability to push the fetus through the birth canal. There are multiple factors involved with development of Uterine Inertia, but a genetic predisposition is suspected. Despite this, a genetic marker for Uterine Inertia in dogs has not yet been identified. The aim of the joint PetPace/Orivet study is to identify genetic markers and biometric data patterns that indicate both risk and actual occurrence of Uterine Inertia in canine labor. This information will be used to develop tools for breeders, veterinarians and pet owners – enabling them to provide better dog pregnancy care and management, more effective risk assessment, earlier identification of Inertia during labor, faster medical intervention when necessary, and overall improved chances for a favorable outcome. Previous tests to collect biometrics on pregnant dogs of various breeds show promising results as to the likelihood of identification of pregnancy and the timing of whelping. The current study may expand this capability by providing valuable information regarding the most common medical complication associated with whelping. “Combining vitals, behavioral and phenotypic data with genetic testing and advanced analysis can help us eventually create a risk assessment and management tool for Uterine Inertia in dogs,” said Dr. Noam Pik, BVSc, BMVS, MBA, MACVS, the CEO of Orivet Genetic Pet Care. “Such a tool will be of great value to breeders and any caretakers of pregnant dogs,” he continued. “This joint study is yet another example of how PetPace applies its core technology to specific medical conditions to improve our overall ability to detect and manage common and serious diseases,” added Dr. Asaf Dagan, DVM, Diplomate ABVP (Canine and Feline practice), and PetPace’s Chief Veterinarian. PetPace was founded in 2012 to bring peace of mind to pet owners and prevent unnecessary pain and suffering for dogs and cats through improved pet health and quality of life. PetPace specializes in the remote monitoring of pet vital signs by utilizing advanced analytical methods and alerting models. The company’s low power, wireless collar is fitted with an array of sensors that report abnormal vital signs within established physiological and behavioral parameters. Once an abnormal sign or behavior is detected, a sophisticated cloud-based analytical engine evaluates the signs and if needed, sends an immediate alert regarding any suspected condition. This allows the owner or the vet to take preemptive action to protect the pet’s health. For more information about PetPace real-time pet health monitoring, visit www.petpace.com. Orivet Genetic Pet Care is a leading personalized-medicine organization offering innovative health care solutions for veterinarians and pet owners. The organization was founded in 2010, on the premise that each pet is unique, with its own set of specific traits, behaviors, genetic health needs and inherent risks. Orivet works with veterinarians, pet owners and responsible pet breeders to provide practical, evidence-based platforms focused on identifying risk and improving clinical outcomes. Learn more at www.orivet.com. Dr. Smadar Tal graduated with honors from the Ontario Veterinary College, Canada, in 1992. After several years of working in private practice in Canada, she relocated back to Israel, where she eventually established, owned and managed a large, progressive and successful private small animal practice for 22 years. While in practice she pursued her passion and became a diplomate of the American College of Theriogenologists. She went on to become a diplomate of the European College of Veterinary Reproduction. Her training and experience have provided her with extensive knowledge and clinical expertise on subjects ranging from the male and female reproductive systems, pregnancy, parturition and neonatology to general medicine and surgery. At present, Dr. Tal is head of the small animal theriogenology department, the veterinary teaching hospital, Koret school of veterinary medicine, the Hebrew university of Jerusalem There she is involved in clinical work, teaching DVM students, and conducting research. Main research interests include biological and medical aspects of canine pregnancy and neonatology, and reproductive system as a diagnostic tool in working dogs.